My review is on the Anker PowerCore+ 20100 USB C. I bought this for my devices. I am always using my electronics. This can charge my iPhone 6 Plus 7 times on one charge. I am always traveling and using my GoPros. I own 3​ . I love filming my adventures. This thing never lets my GoPros or other electronics die. It also very nice that this has USB C because that is what all devices are going to. This is my favorite battery pack because of all the juice it holds. I will be reviewing the Anker Powercore 26800. Personally it is one of the best portable chargers out there. It can charge my iPhone 7 at least 10 times which is always more than enough. I just got back from Boy Scouts for a full week. This charger lasted that week and still was able to charge my phone after that week. I recommend this to anyone who just needs a good portable charger. It can charge my action camera whenever I need to on vacation. My friends always tell me about how well it works and how they want one too. Review of Anker USB-C Mini Dock - A must have for Macbook Owners! If you own a newer model of Macbook, then you know the importance of USB-C hub adapter. The upgraded Anker’s USB-C hub has checked two of the three boxes right off the bat to make a decent USB-C hub: have all of the necessary ports, and make it look good – like real good. The third has to do with the quality of the ports within that beautiful casing, and that's where problems begin for most USB-C hubs makers. But Anker’s USB-C port is different and has the potential to the best adapter available on the market under $100 price range. The Anker hub features six ports in total: 2 USB 3.0 Type-A ports, 1 HDMI, 1 SD Card, 1 Ethernet, and 1 USB-C port, packed into solid-feeling aluminum block. It has built in pass-through power over USB-C, high-speed internet capability, 4K HDMI output, and 5Gbps data transfer speeds. These compact hubs have full-fledged computers in them to handle all this conversion and not get in the way of data transfer. I particularly like that the USB-C port for pass-through power is at the end of the longest dimension. Couple with an 8-inch integral cord to plug into your MacBook, this gives you a lot more flexibility in placement. It’s just 3.36 ounces, making it a slight addition to your travel bag. I use the power Core 2 10000 mAh on a daily basis. I use it when I need to fully charge my device from zero or even to just top it off. It has been very useful in situations where my power goes off or on road trips. I never leave the house without it because it is so small that I can fit it in my pocket without worrying that it fall out. The best thing about it is that if I forget to charge it one day I don't have to worry about it because I usually only use it once and it still has about half charge. Uploading some product images could help you gain more "likes". Good to know your story with Anker! Very good example for video review! I really want to know how long you usually prepare for video review? I really want to know how long you usually prepare for video review? Thanks! It usually takes about of week or two of testing, then 3-4 hours to create the video. Anker once again has put out a future-proof quality charger for just about any USB chargeable device out there, including new USB-C devices. They follow the USB Type C specification and do it very well. Charges my Samsung S8 at full speed (3A) and my MacBook at full speed! Just make sure to use USB-C spec power delivery cables, like Anker's own or what came with your device. A Quick Charge 3.0 port would've been a nice addition, but the other 4 ports deliver up to 2.4A each. I'd also like to see an Anker car charger with fast charging dual ports (USB-C and USB) that features Bluetooth and work with a smartphone app that's also a car locater. This power brick is slightly longer & wider then the older PowerPort 5, yet still easy to carry around as a travel charger for up to 5 devices that need charging. The body finish is an Anker trademark, black matte style. Comes with a long power cord that only takes up one power receptacle. Highly recommended. 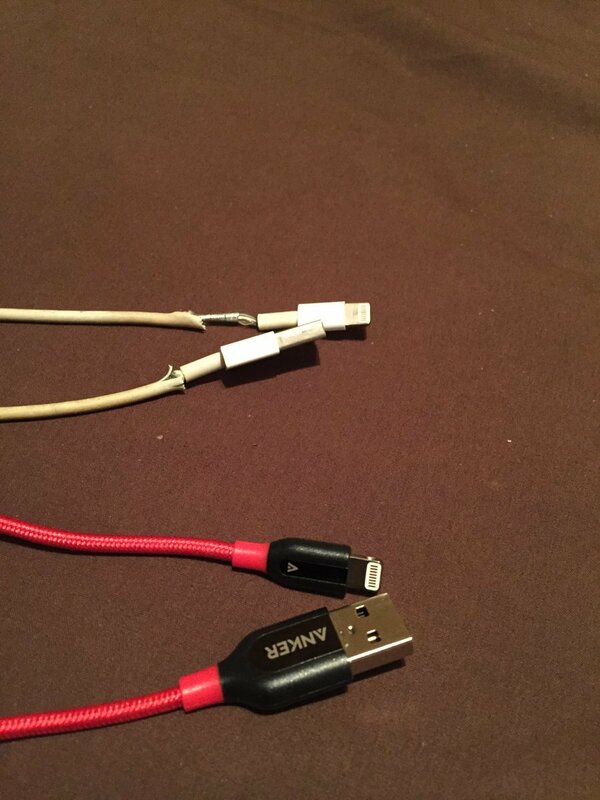 Just recently received my new lightening cable from @AnkerOfficial and so far I'm quite impressed. I PowerLine+ Lightning Nylon Braided Cable 3ft came in right on time especially since I'm using this lightening cable that came from Apple when i first purchased my iPhone 6. Lets talk about what I like about the cable thus far, the cable appears very durable and is made with Kevlar and covered by this Braided nylon which should in theory resist the heat and prevent fraying normal wear and tear unlike the apple lightening cable. In the below picture you will see a quick side by side comparison of the apple lightening cable compared to the @AnkerOfficial PowerLine+ Lightning cable. Apple cable only comes in 1 color and size where as @AnkerOfficial cable comes in 4 different colors and 4 different sizes to fit all needs. If you don't believe me take a look for yourself https://www.anker.com/products/B8121091 So when you the new iPhone 8 comes out shortly go grab you some charging and syncing cables from @AnkerOfficial directly. Hi this is for the Anker Powercore 20100. In simple and sweet words enough juice for you electronic devices, travel worry free if you carrying one. For me I have been using it for charging my note 5 and iPhone and a tablet for my daughter and during long flight it give me a peace of mind that I will never run out of juice for techie family. Trouble using it no way... Anker do it in a smart and strong way... If you put your trust in Anker you will always be rewarded with some smart stuff. I would always recommend with a strong agreement and can trust Anker products blindly. Try one and you bet you will not go to any other brand for your charging needs. I'm working on the subtitles. How’d you like my first written review?! I reviewed the Anker 6 Pack of Usb Cables! Best Usb Cables Ever! These are the best USB Cables I've ever used! They are very well made and feel like they will last forever. I've been using these cables daily for a few months and you cant even see any wear on them. This 6 pack is also a great value since you get 6 assorted length cables for a great price. Its also great to know Anker's products come with an 18 Month warranty even though I dont expect to ever have to use it! They also come very nicely packaged and each cable has a nice velcro strap for clean and easy storage! I highly recommend these cables! Hi @r0d_risi , it would be better if you could post your review in English to gain more likes / reads. Also tweaking your photos to a smaller size would be good. My PowerCore+ 10050mAh is absolutely fantastic!